The voice was Bill Neve, Center Airport manager some thirty years ago. The radio was in the Piper Cherokee 180 I was piloting out of the Center, Texas Airport on a sunny Saturday afternoon. The destination was just north of Center at Mount Pleasant for a visit at my parent’s house. The short 45-minute hop with a panoramic perspective of East Texas made numerous times before was routine, but this one would turn out to be more of an adventure before we got the bugs worked out. Memories of that adventure grew wings again last weekend as Gary Borders and I pored through files at the Mount Pleasant Daily Tribune office in preparation for the newspaper’s move downtown. 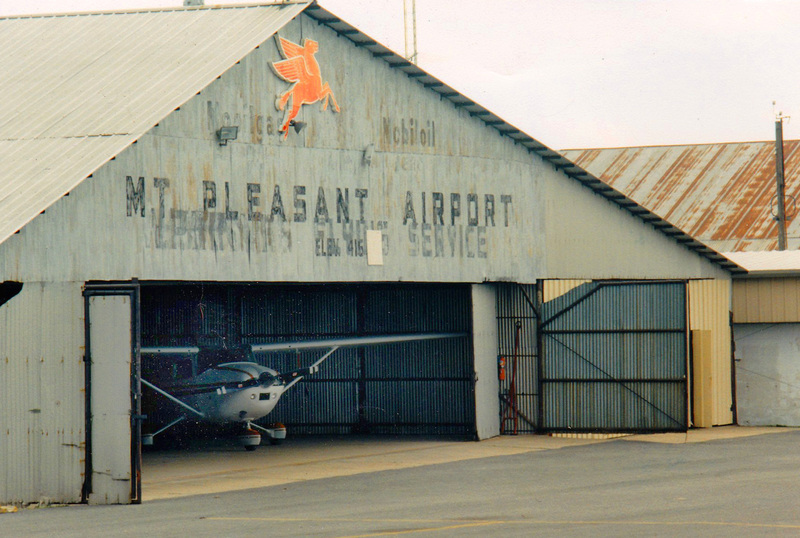 A photo of the old Mount Pleasant airport in a dusty box recalled fond memories of time spent there. The big tin hanger with the Mobil flying red horse over the doors and the windsock at the roof’s peak caught my eye. Faded letters above the doors noted for aviators, the airport’s name and elevation. I remembered Bill Phinney was the airport manager when pilot friends taking me up for fun created a keen interest in flying. People like David Brogoitti, Ronny Narramore, Jim McGuire, Gale Braddock and James Spann kindled an interest that ultimately lead me to enrolling in flight school. Doyle Amerson got me through ground school and first solo stages before his untimely death. Soon afterwards, Grady Firmin returned from military duty as a flight instructor guiding me to the goal … a private pilot’s license. Preflight for the adventure 30 years ago was routine. Family on board and knowing my mother would be waiting for us, I taxied the aircraft onto the main runway and applied full power for the takeoff roll. About midpoint of the runway, the airplane began to feel light and ready to fly. A check of the airspeed indicator to verify liftoff speed didn’t look right. The ground fell away beneath us, but the airspeed indicator was not moving. Climb out felt normal. We were airborne, but critical instruments were not functioning. The typically short trip aloft seemed like an eternity without benefit of useful, if not vital information. The pitot-static system is a pressure system used in aviation instruments to determine an aircraft’s airspeed, rate of climb, altitude, and altitude trend. Lack of this data lends new meaning to flying by the seat of your pants. Pilot training emphasizes a need for being sensitive to the feel and sound of your aircraft. I’m pretty sure I could have described every sensation shared between the two of us that day in a relationship nearing intimacy. Taxiing the plane to a stop in front of the very hanger pictured in the photo in my hand last weekend, I wiped sweat from my brow, dried my hands and looked up to see mom waiting for us, smiling and waving. No maintenance was available on Saturday. So, assuming that if we did it once, we could do it again, the visit was cut short in order to ensure completing an encore performance before dark, and hopefully as successful, at the Center airport. An old saying among pilots allows as how there are three useless things to an aviator: runway behind you, altitude above you and fuel at the pump. With this in mind and the sun setting behind me, I took the airplane to an altitude of comfortable height and aligned it with the Center runway heading miles prior to seeing the airport. The result was a long, gradual straight-in approach to home. Once again, wheels gently kissed the runway without even waking the kids as they slept in the back seat. It’s been a number of years now since I’ve piloted an airplane. I just wonder if dirt daubers are still a threat to working the bugs out of flying? I enjoyed the column Leon! Have you ever read any of Carl Hiaasen’s books? Thanks Patty! I have not, but I found his website and will look into his work.